Our major research focus is host plant location, selection and assessment by psyllids (Hemiptera: Psylloidea) and the impacts of their feeding on plant primary (free amino acids) and plant secondary (phenolics) metabolites as well as on foliar pigments (chlorophylls and anthocyanins). We are interested in how these ‘manipulative’ insect herbivores accelerate leaf senescence and cause chlorotic tissues to become susceptible to photodamage. 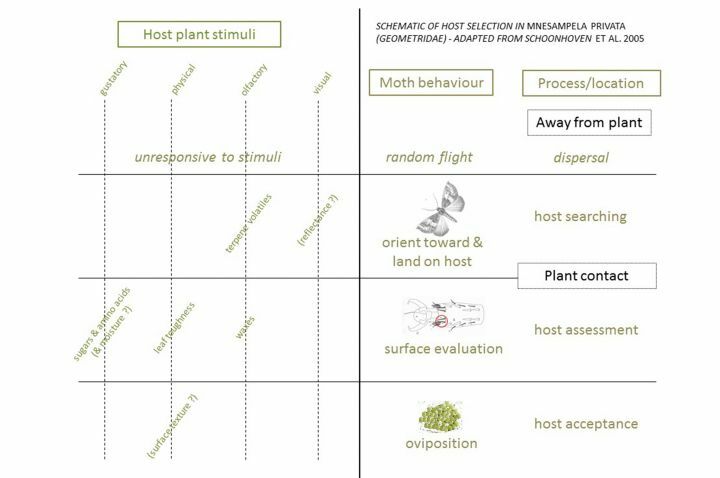 Hypersensitive responses and gall initiation by plants arising from feeding by other manipulative insect herbivores (such as galling wasps and flies) are new areas of research for the lab. We collaborate with Australian entomologists expert in the taxonomy, systematics and ecology of hemipteroid insects. We also collaborate with entomologists, chemical ecologists and plant physiologists based in Brazil, Finland, Germany, Kenya and the USA. We are interested in the roles of leaf surface waxes on host selection and assessment by lepidopterans, especially native geometrid moths. We are also interested in the roles of foliar monoterpenes on host selection and herbivory by chrysomelid leafbeetles as well as ruteline and melolonthine scarab beetles. We have a strong track record in providing applied research findings on lepidopteran and leafbeetle pests of eucalypt plantations to foresters. We collaborate with experts in vertebrate herbivory of eucalypts and organic chemistry in other Australian universities. We are interested in identifying general principles that explain the diversity and abundance of Australian insects on eucalypts and acacias. Our long-term objectives are to link the incidence of specific plant secondary metabolites (PSMs) to the radiations of different insect taxa and seasonal variations in plant nutritional quality to the population dynamics of important herbivores. Please contact me to discuss your research ideas and opportunities to study in the Insect-plant interactions lab. Prospective Honours students should visit the Departmental Honours webpage to view any specific research projects which were presented during an information session.